Ans. =>As a child in grammar school, we had to do book reports. I learned to enjoy reading and writing. This helped me in college, pharmacy school, then a professor teaching ethics at Santa Rosa Junior college, and as an author. 2.How long does it take you to write this books? Ans. => Words poured through my fingertips, as if someone else was writing. I love that feeling when you are in spirit! 3.What is your work schedule like when you're writing? Ans. =>The mornings are for thinking and reflecting on key words and ideas. The afternoon and sometimes at 1 AM are for writing! Whenever inspiration hits! 4.What brought you to write this book series? 5.How you become a published author? Any inspiration? Ans. => Persistence. Never ever give up! In anything in your life, if you feel you are being pulled, pushed and guided, follow the yellow brick road! For writing, just write one sentence at a time. One sentence a day if that is what it takes. After a few days you have a paragraph, then another, then a chapter. 6.Where do you get your information or ideas for your books? Ans. => From real life and events. Mark Twain said, “Write what you know.” It never fails! 7.When did you write your first book and how old were you? Ans. => My first published book through a legitimate publisher came as a third career! I was in my mid-50’s. 8.What do you like to do when you're not writing? Ans. 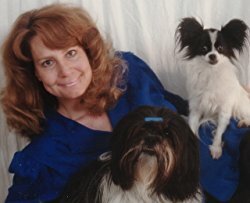 => Play with my dogs and care for my pasture pets! 9.How many books have you written? Which is your favourite? Ans. => There are four. The children’s series, “The Adventures of Rosy Posy Papillion”, and the growth educational books, Medicine Child’s Play, Escape into Excellence, and Embrace Your Excellence. They each serve a purpose, are unique, and have a special place in my heart. 10.What's next for you? What are you working on now?